How do I get started using the Learning Genie program? All you have to do is sign up! You can sign up through our web portal at Learning-Genie.com, or you can download the app and sign up from there. What devices is Learning Genie available on? The “Educator” App is available on iPhone, iPad, Android Tablets, Android Phones, and through the Web Portal by signing into our “Learning-Genie.com” website. *note* Certain features are web portal exclusive such as exporting daily reports and portfolios to PDF, and DRDPtech integration. 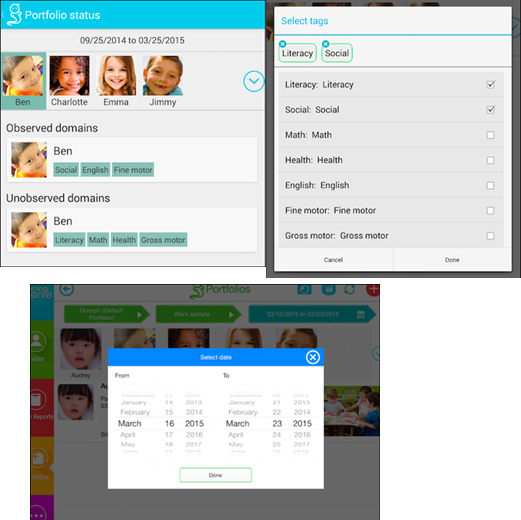 The “Parent” App is available on iPhone, iPad, Android Tablets, and Android Phones. What if I need help using the Learning Genie program? We have an abundance of resources to help you when you need it. If you can’t find the answer you’re looking for here in our FAQs, try out video tutorials or down-loadable user guides. If those don’t help, feel free to reach out to a friendly Support Genie at 760-576-4822 or help@learning-genie.com. What is the difference between an Admin and a Teacher account? The admin account belongs to the user who initially signs up with Learning Genie for your school as a “New Center”. The Admin is the person who invites Teachers through that account to join them. The only other difference between the two is that admins can view and edit any center or classroom within the account, while Teachers can only view and edit classrooms they are assigned to. Why should I choose Learning Genie over traditional reporting methods? By using the Learning Genie program as a reporting tool, you not only save time and money, but as a teacher or administrator, you’re providing a means of giving your students the full attention they deserve. 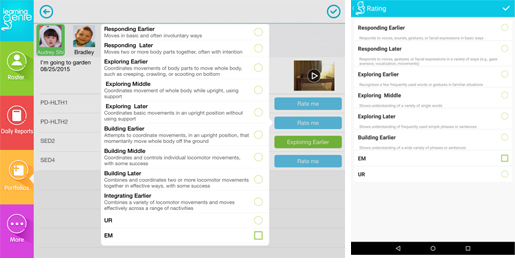 With the Learning Genie app, you and your staff can snap a quick picture of your activities, jot down a few sentences, and later tag and rate a few measures for the entire class at the same time. Once it’s time for reporting to DRDPtech, it’s a snap! This allows your teachers to be fully engaged in their classrooms, and not spend time jotting down multiple notes for each child and bubbling for DRDPtech. By using a digital platform, you can save a surprising amount of money on binders and paper, estimated at more than…. What are the benefits of using learning Genie as an administrator? By using Learning Genie as an administrator, there are numerous organizational benefits. 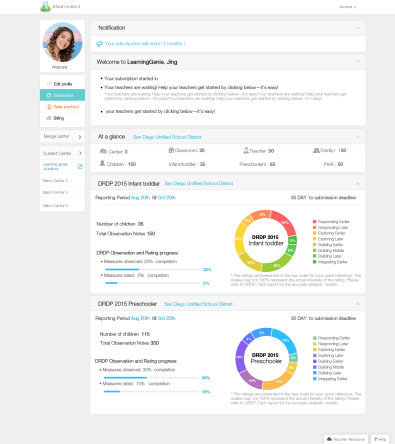 When using the dashboard view you can view your center as a whole and check on how your DRDP rating is going throughout the school year. It also provides a quick and easy way to view all of the activities going on in your center giving you peace and mind about the center’s day to day activities! You also have the opportunity to quickly and easily share your center’s activities with the parents of your students through utilizing the daily report feature with the Learning Genie Parent App. How much is Learning Genie after the free trial? Pricing depends on the child count at each center. Please refer to our “Pricing” page. How do I manage my center as a whole? To view your center activity as a whole, we have created an admin “Dashboard” that gives you a multi-view feed of your teachers, classrooms, and students. This gives you admin features that help you better gauge your daily activities, education plans, and you can see how well your students are improving and what they need more attention on. To get to this press the “Dashboard” Button at the top left corner. Do you provide training for my staff? The Learning Genie interface is easy to use, and can be mastered within 15 minutes. With that being said, we know that some people are not tech savvy, or are just plain too busy. If that’s the case, we offer a few options for helping your staff get started. You can set up an online webinar with us, where we can demo the app live on your computer screen, and your teachers can follow along. We also provide a library of resources to help you efficiently present the program to your staff. Try browsing through our teacher resources. To Request a Web Demo please fill out the form at the bottom of this page For Educators. What if I have multiple centers/sites? Only the director of the school or admin of the Learning Genie account can add and change classrooms. This is to keep everything synced together and to provide the best organization tools for your center. *note* if you are a teacher who has accidentally made your own center you can always merge into your Admin’s center to join your school’s account. See “Can I merge centers?” question in this FAQ, under the “For Teachers” section. How do I edit my classes’ learning standard? You can choose your classrooms learning standards when your center or classroom is first created. As well as change your current learning standards to something else. Here’s how! 2.Click the “Edit Pencil” icon in the top right hand corner. 3.From here you will be able to change your classes standards from the drop down menu. 1.From your home-page hover over a classroom with your mouse. 3.A pop-up will generate, here you can select your standards from a drop down menu. How do I add a teacher to multiple classrooms? You can add as many teachers to as many classrooms in just a few steps from both the web portal and our cross platform app. 1.From your “Roster” page, press “Add Teacher”. 2.From here select one of your “Teachers available from other classrooms”. 3.You can add teachers to multiple classrooms from this page. 2.Hover over desired classroom where you would like to add another teacher. 3.Select one of your “teachers available from other classrooms”. How do I remove a teacher from a classroom? If a teacher leaves your school or you need to remove her from a specific classroom you can do that from both a Tablet, and through the Web Portal. 1.From the “Roster” page of desired classroom. 2.Press the Edit Pencil in the top right hand corner. 3.From here click the “X” in the small green box next to the classroom. 2.Hover over desired classroom with teacher you would like to remove. 4.From the pop up window you will notice your teachers with the classroom name in green next to them. 5.Click the “X” in the small green box with the classroom name. How do I remove a child from my center? You can remove a student if he/she is moving to a different school or transitioning between grades, all of their information will be stored in our cloud for archival purposes of the center. If you need hard copies of the information you have recorded for this child we suggest you Generate a PDF report for your files. You can do this from a student’s Portfolio. 2.Select the student you wish to remove. 3.Press “Remove from your Center” and this child will be removed. 1.From the home-page, hover over the classroom with the desired child you would like to remove in it. 2.Hover over this class and click Student”. 3.Scroll to desired child and click the small arrow next to their name. 5.When prompted press “Yes” if you are sure you want to delete this child. How do I add teachers to their classrooms? Teachers, like parents need a one-of-a-kind code to join their center for the protection of the students. Teachers should wait to sign up until you have provided these codes for them, so that they are synced with the center you created. 3.Once you have added a teacher you will see their status listed as “pending” with a code beneath it. 4.You will also receive a PDF sent to the Director email. 5.Pass this code out to your teachers for them to sign up. 1.Once you have received your teacher code from your administrator, either download the app onto your device or navigate to the web portal and click the “sign up” button. 2.You will be asked to provide your teacher code upon starting the sing up procedure. I don’t see my state’s Early Learning Standards, can you they be added to my system? Yes we can! On the iPad Press the “Cannot find your standards? We can help” button on an Android device press “Load Customized Standards”. You will be prompted to give us the name of the Standards your require. To help with the process attach a PDF file of these standards. In most cases we can take your learning standards document, and put them into our system. What if I have little or no WiFi? Any observations made on the go, in a limited WiFi setting can be saved as a draft. This is done by writing your observation or report item as you would normally, but pressing the back arrow, to return to the classroom screen, instead of the blue check mark in the upper right corner to save the observation as you would normally. When you press the back arrow, a dialogue box will appear asking if you would like to save, return to the classroom page without saving, or save observation as a draft. If you choose the third option to save as a draft, the measure will appear pink, rather than white. This means your observation has been saved as a draft. To publish your draft simply press the edit button and save it with the check mark icon. *note* Drafts are saved to your device, and will not appear in the web portal until you have published. Post anything in an area with weak or no WiFi just as normally do. When you submit it, a red exclamation mark (!) will appear next to the notes. This means that your post is pending and needs to be synced to the cloud server. Once you are in a location with WiFi, press the refresh button at the very top of your screen. This will sync your posts to your center, and send to parents. 1.From the log-in screen you will see a “Forgot my Password” Button. 2.Press this and it will prompt you to change the password connected with your email. What if I have an idea to make Learning Genie better? Hooray! We love your feedback and ideas. Contact us at help@learning-genie.com or call us at 760-576-4822. We are always improving our app and will try our best to accommodate your suggestions in our next update. We also strongly suggest that you join our Learning Genie Teacher Ambassador Facebook group. This is a private group where we ask questions and discuss ideas to improve the app. We provide Web Demos/Web Trainings for anyone and everyone who wants a better understanding of Learning Genie! We recommend this for everyone to prevent future confusion with the app! Please scroll to the bottom of “For Educators” to schedule a demo with one of our Customer Support Genies! 1.If your director has already started your center’s account, he/she will provide with a code to sign up and join your class. 2.Download the app from either the Apple App Store or Google Play Store. 3.Tap “join your class.” You will then be prompted to enter your code. 4.Another option is to sign up through the web portal, here. Tap on the green button to enter your code. How do I get started if my director hasn’t started an account yet? To fully utilize the full features Learning Genie offers, we prefer that your director gets involved for the best experience possible. You can start using demo classes whenever you wish, and register your center for your director with [her/his] consent. Please note that the e-mail registered is the Admin of the Learning Genie account and will be very important. You may discuss with your director on which Email account to use. If you begin to make actual observations with your first account and wish to save them, you may need to preform a center merge. See question below “Can I merge centers?” *note* It is always a good idea to discuss starting Learning Genie with your director first, although is not necessary. What’s the difference between an admin and a teacher account? The admin account belongs to the user who initially signs up for Learning Genie for your school. The Admin is the person who invites Teachers through that account to join them. The only other difference between the two is that Admins can view and edit any center or classroom within the account, while Teachers can only view and edit classrooms they are assigned to. You may contact Learning Genie Help Desk at any time, through the application as well as our Web Portal. When formulating your question please give as much detail as possible about the current issue so we may better assess the situation and help you in a timely manner. Feel free to email us at Help@learning-Genie.com, or call at 760-576-4822. We’re here to help 7 days a week, 24 hr a day. How do I sign up if my email has already been used? Just contact us! Send and email at Help@learning-genie.com. Provide us with the email that you signed up with and we can reset your account to allow access to the correct center. Please allow 24 hours to reflect change. If you signed up with a teacher code, your classroom will already be created by your center director. You can start adding students for your classroom if your director has not done so yet. Here’s how! 1.From your Classroom “Roster” page. 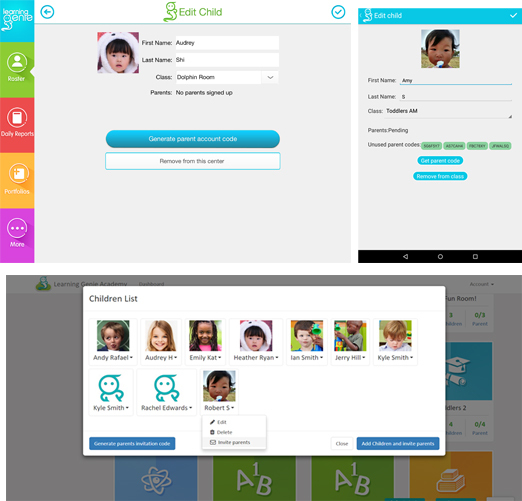 2.Press “Add Child” and start adding individual students. 3.To add multiple Children at once, log in through the Web Portal and upload a CSV file or copy and paste from Excel. *note* Once your students have been added if you have also input the parent’s email addresses, the parent codes will be sent to your schools’ Director. He/She can pass these out to teachers to give to parents. How do I remove a classroom? 1.Go back to classroom view (you will see the demo class and any other classes you have created). 2. Press and hold the class you want to delete. 3.Your class is now removed. *note* this feature is not available for iPad users. How can I collaborate/share with other teachers? To collaborate with other teachers you want to make sure that your director has added other teachers to the class that you are currently working in. This way you will be able to see the work that the other teacher is posting. You can do this by refreshing for each child and it will generate all other teacher posts. How do I invite parents? We know a child’s personal information is so important. We have made it easy to only allow parents and extended family members to view these daily reports sent by teachers, with “Parent Codes”. These are one-of-a-kind codes for each individual parent or family member. 2.Press “Get all parent codes” for all parent codes. 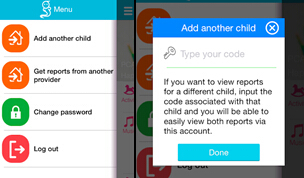 3.Press “Get parent codes” next to the child for their parent codes specifically. 4.The codes will be sent to the directors email for them to pass along to the parents. 5. *note* If you were able to input the email address of the parent, at the time you add children, a parent will automatically get a parent code sent to them. 2.Hover over a class and press “Student”. 3.From here click “Generate all parent invitation codes” to get all parent codes. 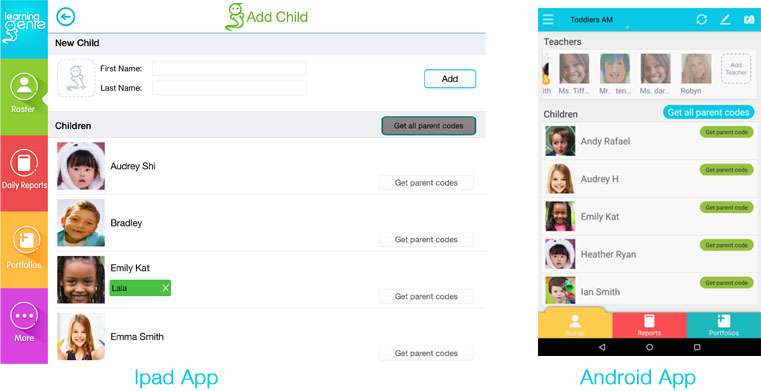 4.Press “Invite parents” next to individual child to receive this student’s parent codes. 5.The director will receive an email with these codes, Please pass these out to corresponding parents. How do I edit a child? 1.Go to your classrooms “Roster” page . 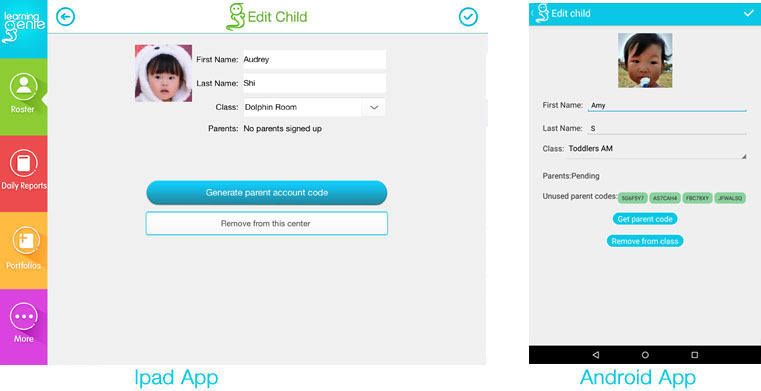 2.Select the child you would like to update, and tap “Edit”. 3.Here you can, change a child’s profile photo, remove them from your center, or change their name. You can remove a student if he or she is moving to a different school or transitioning between grades, all of his information will be stored in our cloud for archival purposes of the center. If you need hard copies of the information you have recorded for this child we suggest you generate a PDF report for your files. You can do this from a student’s portfolio. 2.Scroll to the student you wish to remove. 3.Press“Remove from your Center” and this child will be removed. 1.From the home-page, hover over the classroom with the desired child you would like to remove. 2.Hover over this class and press “Student”. 3.Scroll to desired child and press the arrow next to their name. How do I rate/score measures that I have tagged in an observation? Thanks to Learning Genie, you can now “Rate” a standard that you have tagged a child with. This can be done in just about 5 simple taps of your finger. *note* You are only able to rate measures through our app, When using the web portal, you are able to select, but not rate measures. This is however a feature we hope to release very soon. 1.Create and post your students observation with selected measures. 2.Once posted, tap on these measures and it will bring you to the rating screen. 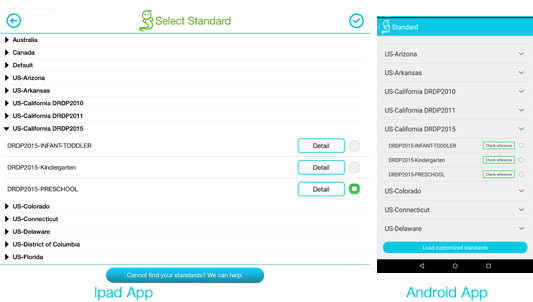 3.Once you have rated the measures, tap the check-mark at the top right hand corner. 4.You will notice the measures have filled in green, this means that they have been rated. How do I add photos and videos to an Observation/Daily Report Entry? You can add pictures and videos from both the tablet app and the Web Portal. You can add up to 4 images (Captured or from your library), Or a 15 second video. Here’s how! 3.Press the empty photo icon to select or capture a picture. Can I print a child’s portfolio or daily report? Yes this is possible and a great way to keep hard copies for your centers evaluations and audits. Here’s how! 1. *note* From the Web Portal only. 2.Go to desired child that you would like to download a hard copy report. 4.Select the month that you would like to download from (Up to 6 Months). 5.A PDF will download and you can print this out for your records. 6.To download a PDF of the daily report, simply click the “download” underneath the date range box. Can I create daily report items in advance? No, at this time you are unable to set observations or daily report items at a future date. Can I delete an entry after its been posted? 2.Go to the post you would like to delete, and press the “Trash Can” Icon. You must confirm that you want this deleted. Can I have the same student in multiple classes? 1.Go to the Roster Page and click on the child you want to move. 2.Tap the drop down menu labeled “Class” and select the classroom you want to move the child too. 3.Click the check mark in the top right hand corner of the screen to confirm. Yes, absolutely! If you have made an account to practice using learning genie, made a few observations, and would like your center to be merged into your administrators center. *note* the smaller organization should always merge into the larger admin organization. Please see our step by step PDF guide in our support center. Can I move a student to another class? Yes, you can transfer or move a student to another class. 1.From your classrooms “Roster” page. 2.Press the “Edit Class” at the top right hand corner. 3.And press the child you would like to add to another class. 4.Here you can move them into any class you desire, all the information for them will be moved with the student. How can I organize my portfolio view? There are multiple ways for you to filter and organize your portfolio assessments. You can view and filter by child, by date range or by specific domains/tags. You are also able to view all of the observed and unobserved domains for specific children during a specific date range. How do I send a message to multiple parents at once? You can use the “Reminder” or “Other” option in the daily reports as a way to send out a general message to parents. 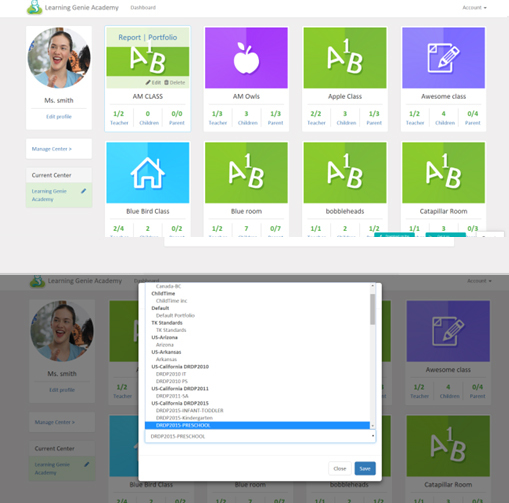 You can even share a daily activity that the entire class participated in to the parents, by selecting “All” students while editing the report. *note* Reminders show up as highlighted entries on the Parent App. Can I view past reports and portfolios? Of course! In the “reports” page, you will see a calendar icon in the top right corner. This allows you to select a date to view. 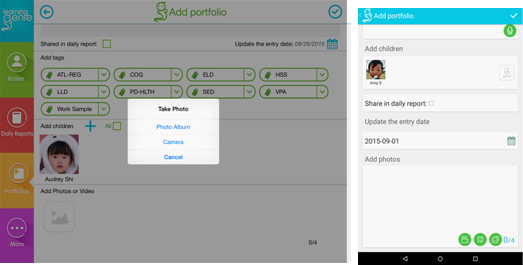 In the “portfolio” page, select the date range option to customize the dates you are viewing. Learning Genie will never delete information unless you manually delete it yourself. Yes, you can reset your password through the app by clicking “Reset password” in the sidebar. You will need to enter the registered Email address in order to receive a password reset via e-mail. Can I combine classrooms so that during early morning or late afternoon hours, teachers on duty can still record information for the children in the combined classroom? We have certainly considered this special need. Our current solution allows one teacher to be assigned to multiple classrooms. Therefore, for the teachers who are responsible for early morning or late after hours, the director can add access for these teachers to multiple (or all) classes so that they can continue to record entries for all children in the “combined” classroom. What happens if delete my account? When you delete your account all of your information is saved in our cloud with the highest protection of your information. This way if you desire to use Learning Genie again all your information will be saved and ready for you to use again. Hooray! We love your feedback and ideas. Contact us at help@learning-genie.com or call us at (760) 576-4822. We are always improving our app and will try our best to accommodate your suggestions in our next update. We highly recommend downloading the Learning Genie Parent App, to view your child’s daily report. This can be downloaded from either the Apple App Store for iPhone and iPad, or Google Play Store for Android phones and tablets. To create your parent account you must receive a code from you schools to be able to log in and view your child’s Daily Reports. 1.Once you have your parent code. 2.Download the parent app on your device. 3.Once you have downloaded you can sign in with your parent code. 4.You can add your email and password during the next step. 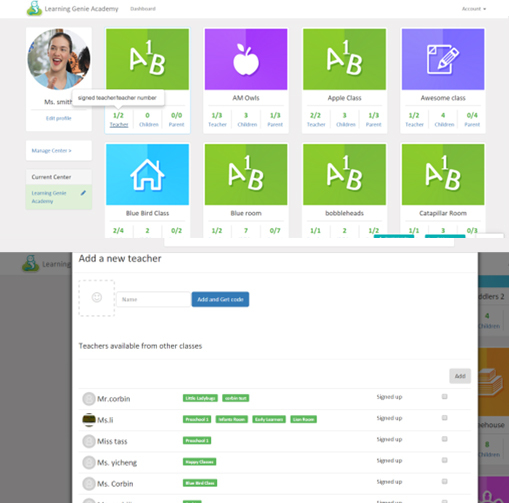 5.Now you are connected with your students daily reports. How do I track my child’s activity through the app? 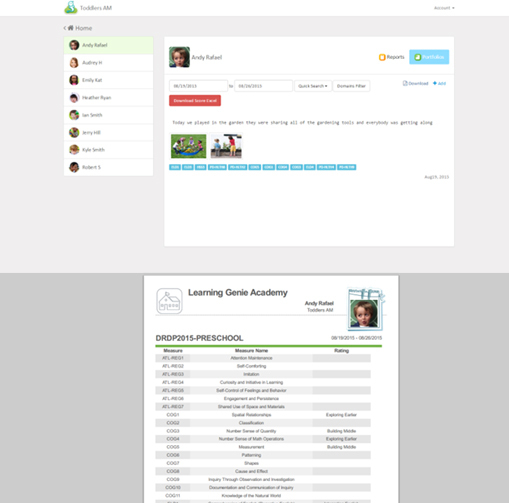 If your child’s teacher is using the Learning Genie “Daily Report” feature, you can see all of the amazing things your child is doing in class as they learn and grow. There are three ways to see your child’s daily report. *Via Email: If your child’s teacher has input your email into your student’s account, or you have used your email to sign up with Learning Genie using a “parent code” obtained from your child’s teacher, then you will receive a copy of the daily report items in your email in-box. 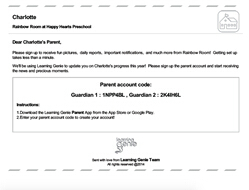 *The Learning Genie Parent App: Once you have received a “Parent Code” from your student’s teacher you can download our learning genie parent app from either the app store, or Google play store, depending on your device. Upon signing up, you will be prompted to provide your parent code. 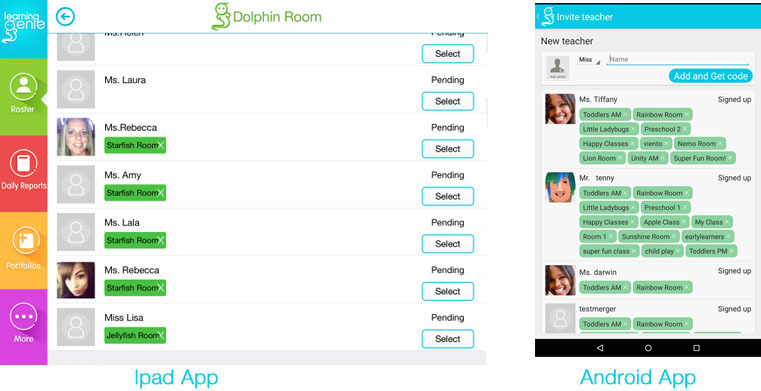 Once this is complete, you will be able to see the daily report displayed in the parent app. *The Web Portal: If you have received a parent code from your child’s teacher and do not have a smart phone or tablet, you have the ability to sign up in the Learning Genie web portal, (In the upper right hand corner of the website homepage). *note* This will only allow you to begin receiving email updates. You are not able to view the actual daily report, by signing into the website. Is there a way I can get all photos in one place for me to download instead of clicking through each email report? Currently there is not a library where all Learning Genie photos are stored in your account. What if I have more than one child whose teacher is using Learning Genie? No problem! 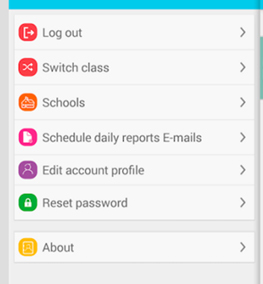 We have created the app so that you can access multiple student’s reports through the same account. While in the app, simply tap the icon in the top left corner to access the sidebar. 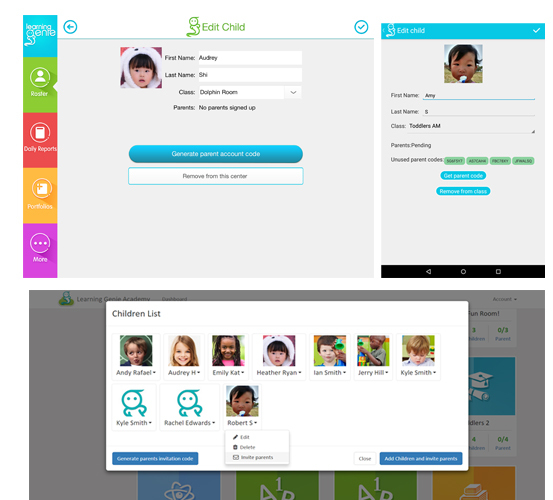 You will see an option that says “add another child.” Simply tap that option and enter the code you received from that child’s teacher. 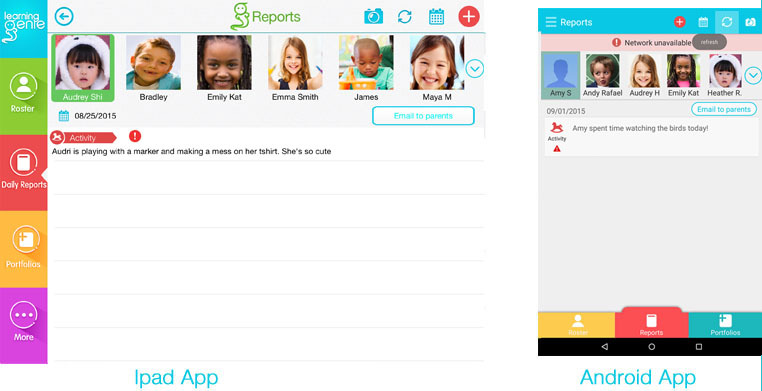 You will now be able to tap on your child’s name at the top of the report to toggle between children. Can multiple family members sign up to get reports for the same student? Yes! You will receive two different codes from your child’s teacher when signing up. 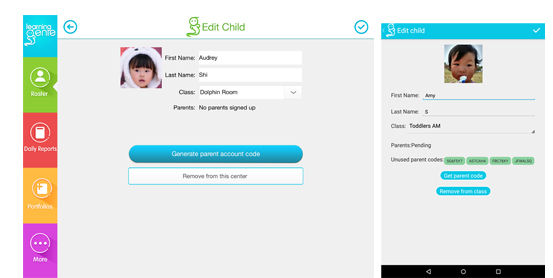 This allows for two separate parent accounts to sign up for updates on the same child. If you have additional family members who want to set up an account, contact your child’s teacher about receiving a new code. What if I need help using the app? If you can’t find the answer you’re looking for here in our FAQs, feel free to reach out to a friendly Support Genie at (760) 576-4822 or help@learning-genie.com. Can I change my parent email but still connect with my child? 1.Contact your teacher to change your email. 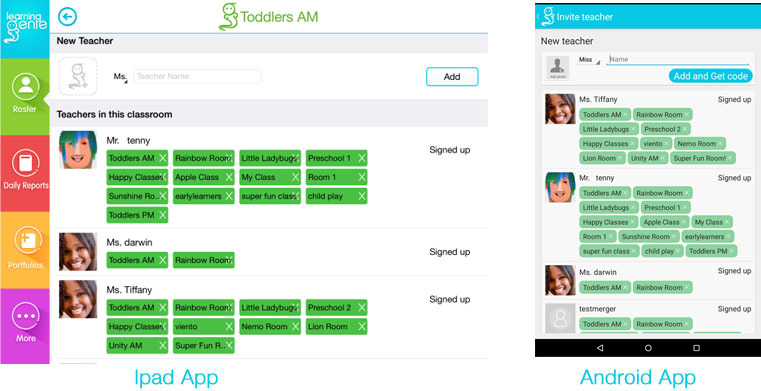 2.This will generate a new parent code for you to sign up again with. 3.You will still be connected with all of your child’s information and all daily report emails will be sent to the new email you have provided. Who has access to the information the teachers record about my child? The only people who have access to this information are: you, any teacher who is part of that same classroom and the center director who holds the Admin account for the app. Learning Genie does not sell any personal identifying information about its users or children. Why am I not receiving daily Email reports? It is possible that the teacher’s email reports are being blocked by your email service. Check your spam folder and filter. Additionally, if you signed up for the Parent App with a fake or incorrect email address, you emails may be going there instead of to you. Make sure to use the email address you would like to get the student reports sent to when you sign up for the app. If neither of these are the case, please contact us at help@learning-genie.com. My parent code doesn’t work! No worries contact your child’s school and let them know that your code isn’t working! 1.Check and see if you have matching codes with the code that the teacher has for you. 2.If this isn’t the case please contact help@learning-genie.com and we can fix this for you. We also strongly suggest that you join our Learning Genie Parent Ambassador Facebook group. This is a private group where we ask questions and discuss ideas to improve the app.